Smeagol, played by sixth-grader Kelly Bate, receives a hug from the Snowman, played by seventh-grader Emma Fuller, during a rehearsal of "Game of Tiaras" at Rockport Middle School. 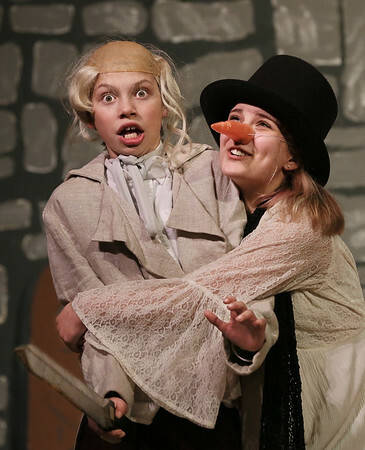 The comedy, combining elements of "King Lear," "Game of Thrones" and various fairy tales, opened Thursday night and will continue Friday at 7 p.m. and Saturday at 2 p.m. at the John Lane Auditorium at Rockport High School, 24 Jerden's Lane. Tickets of $10 for adults and $8 for seniors and students will be available at the door.